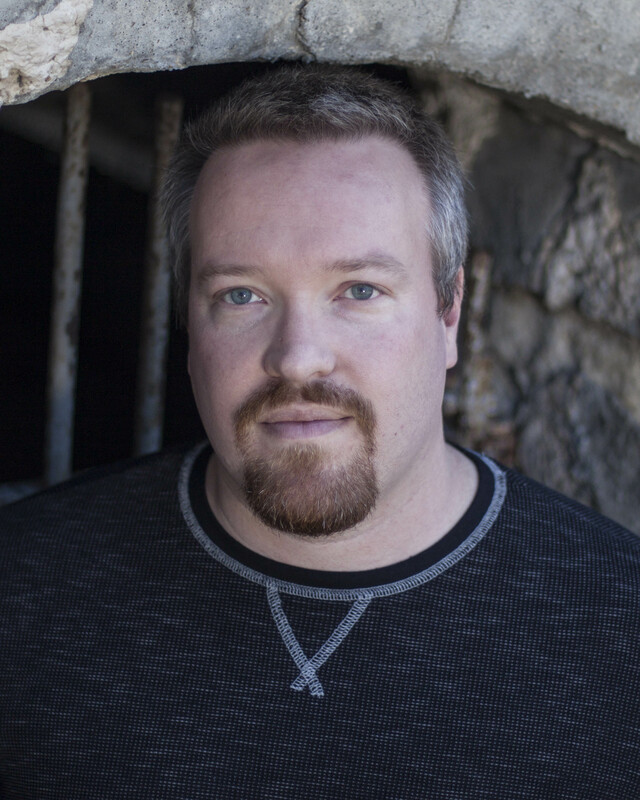 Jack Campbell Jr. – Page 2 – Writer of dark fiction. I bought my first screenwriting books (written by the legendary Syd Field) at Hastings. This began my foray in to creative writing. Prior to that, I was a visual and performance artist. The drum set and guitar sit dusty in the basement, and I haven’t picked up a paintbrush in years. My keyboard, on the other hand, is missing letters because I’ve typed so much. I bought Zen and the Art of Writing at Hastings. Ray Bradbury’s passion for writing rubbed off on me, and I went running to the word processor to write out my dreams and fears with reckless abandon. My process is still heavily-influenced by Bradbury, even if my style has changed over the years. I worked at Hastings for two months in college, just before moving to Lawrence. I spent almost as much as I made, thanks to an amazing discount program, and the readership program gave me a good collection of classic books that provided the base of my extra-curricular literary education. I still have copies of Great Expectations and The Count of Monte Cristo that are missing covers, the price of their liberation from the store shelves. I spent my lunch breaks walking through the stacks at Hastings, smelling the books and trying to soak in words, as if each aisle was a pool filled with nouns, verbs, and adjectives. When I got down on writing, or felt that things were hopeless, I saw all of these books by all of these writers who found the shelves, and it brought me back to work. You can’t place a value on that, but I bought it at the price of a mocha frappaccino and the occasional book. I had my first book signing at Hastings. I sat in the front of the store, heard my name announced over the PA, and talked to every customer that came within earshot. I was nervous, but excited. I met other writers. I sold a couple of books. Mostly, I got used to selling myself as a writer to the public. I sold more copies of All Manner of Dark Things at my local Hastings than anywhere else other than Amazon. For six months, I rode the end cap display, until I was displaced by a number of books by politicians in order to capitalize on the primary election season. I sold several copies, including one to a Hastings employee. She asked me to sign it when I came in for one of my lunchtime strolls. It gives me a thrill to know that complete strangers in my community have my book on their shelf. Over the last few months, I’ve seen the signs. More used and clearance books than new. Large, empty shelf spaces. Fewer employees. Earlier this week, I saw the story that I feared would be coming. Hastings will have declare bankruptcy if they do not find a buyer. Another bookstore down. As much as I would like for someone to buy and save my local Hastings, the truth is that the model is out-dated and the products are over-priced in comparison to their online counter-parts. They can’t compete. Few can. If this is the end of Hastings, as it was for Borders before it, as it probably will be for Barnes and Noble unless they do something drastic, then I have to say thank you to them for being there. Hastings is a chain, but they always treated me like a local business would. They contained so many things that I loved, and as a result, I was able to pursue those loves. I’ve spent thousands of dollars in their stores, and even though that wasn’t enough, their closure will leave a vacancy beyond the strip mall storefront that they occupy. No more random CD’s or DVD’s that I never knew I wanted. No more midnight releases. No more comics. No more lunchtime book section strolls among the works of my peers and idols. No more book signings. No more hope of seeing my name in the horror section next to Ramsey Campbell, rather than in the local author section. That’s a lot of no mores. I hope they save it, but if they don’t, then I am thankful for the memories. Hear’s to you Hastings. We’ll always have Lawrence and Ames. 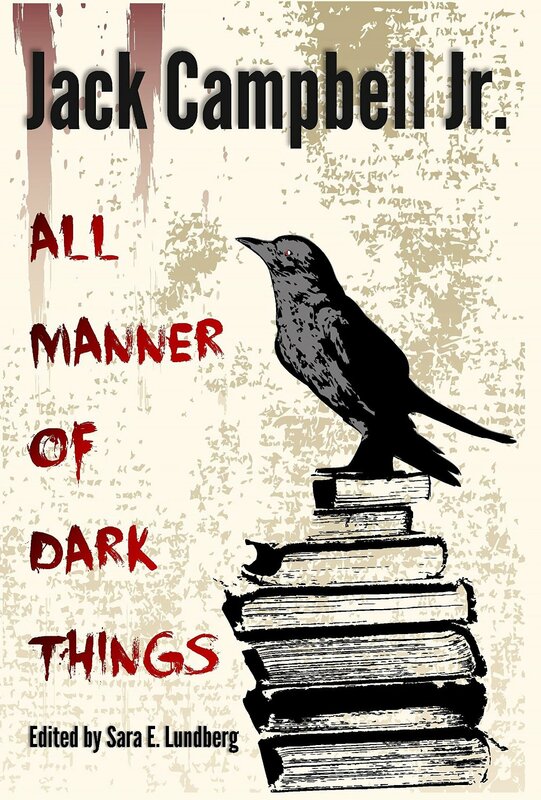 My collection, All Manner of Dark Things is still on sale for 99 cents on Kindle through Monday. You can check it out here. ConQuest is over. I’m tired, but I had a good time. There are a lot of people that I only see at ConQuest, although with WorldCon in Kansas City, 2016 might be an exception. The panels were a lot of fun. The crowd was smaller than last year, but was no less passionate about Science Fiction, Fantasy, and Horror. I served on several panels and had a reading. While my body and wallet are feeling the sting of a long weekend, I can’t wait for next year. I picked up some vintage copies of Weird Tales and The Magazine of Horror. I drank and ate and talked about everything from books to fandom. It was a productive weekend. To everyone that made ConQuest memorable, I sincerely thank you. The creative batteries have been recharged, and now it is time to get back to work. I have critiques due for my Berkeley writing class and books that need to be written. Memorial Day weekend is approaching, and that means two things: my birthday and ConQuest. I always have a lot of fun at the convention. I’ve met some good people there over the years, first as a fan and then as a writer. Last year, I took part in a bunch of panels. It was so much fun that I am doing it again. Writing Groups 3:00 PM: I’ve been a member of the LFK Writers Group for a few years. I’ve been a member of several others in the past. We will be talking about different types of writing groups and what sort of things you may want to look for in a good group. I’ll be on the panel with other members of the LFK Writers Group. Writing Prompts 5:00 PM: Myself and the other writers who contribute to The Confabulator Cafe come up with writing prompts every month. I personally use several different techniques in order to generate story ideas. We will give suggestions, take suggestions, and maybe even come up with some prompts on the spot. This will also be with the LFK Writers Group. Horror from the Headlines: Current Events as Inspiration 8:00 PM: Is there anything scarier than the evening news? Current events can be good fuel for horror stories, but they can be a double-edged sword. We’ll talk about using headlines for inspiration and some of the pitfalls that you need to avoid. I will be joined on the panel by Orrin Grey, Sean Demory, Kristin Helling, and Jim Yelton. Publish Like the Pros 10:00 AM: Independent Publishing is booming due to e-books and technological advances, but there is still a lot to learn if you are tempted to take the plunge. Bottle Cap Publishing will talk give tricks and tips for creating a professional product and promoting it as such. I will be joined by Kevin Wohler, Sara E. Lundberg, and R. L. Naquin. Reading 2:00 PM: I will be reading from my next novella Mama’s Little Boy, as well as “Assholes with Guns,” my short story that appeared in The Literary Hatchet and will be in my next collection Whispers and Proclamations. Film Adaptations: The Best and Worst 6:00 PM: My first writing love was not fiction, but screenwriting. These days, film adaptations are Hollywood powerhouses. Some are good and some are really, REALLY bad. We’ll discuss adaptations that succeeded as well as those that failed. I will be joined by Orrin Grey, Robin Wayne Bailey, and Dora Furlong. Navigating the World of Short Story Submission 11:00 AM: Short story submission is a scary thing. You send your work to strangers, and you often get rejected by them. We’ll talk about how to find markets, submit to them, and how to deal with both acceptance and rejection. I’ll be joined by Lou Antonelli, Jude-Marie Green, and Tom Trumpinski. The Big Three of Weird Tales 3:00 PM: In 279 issues, from 1923 to 1954, Weird Tales Magazine helped spur a resurgence of dark fiction. Powered by mainstays such as Robert E. Howard, Clark Ashton Smith, and H.P. Lovecraft, the magazine became a major influence for the future of weird fiction and featured a large number of legendary writers. We will discuss the “big three,” their legacy, and what readers can learn from them today. I will be joined by Orrin Grey and Donna Munro. It should be a fun weekend. 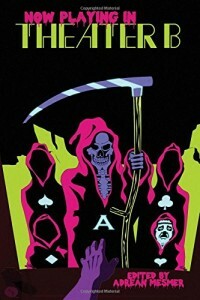 I’ll even have a few copies of All Manner of Dark Things for sale if folks are interested. Check out the full line-up on the official Conquest website. Or you can skip straight to the programming schedule. I look forward to seeing you all there. A w hile back, I took part in a story contest at LitReactor, a literary website that I frequent. The contest required us to produce an original monster and use our hometown as a setting. While my hometown area has always been a source of inspiration for me, “Patchwork” is the first story that I wrote with the geography of Clearfield in my head. That changed a bit in the re-writes leading up to the story’s inclusion in All Manner of Dark Things and the setting changed to that magical Fairfax place that lives in my head. I’ve always been proud of my patchwork monster that steals its bodyparts from its victims. The story that I wrote one afternoon in the corner booth of a busy bar has continued to be one of my favorites. 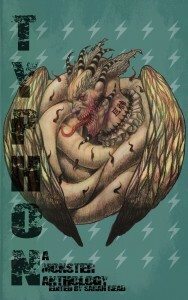 Now, you can read “Patchwork” in an anthology full of great monsters, inspired by the father of all monsters Typhon, and brought to you by Pantheon Magazine. If you are unfamiliar with Pantheon, they put out a spectacular product, and Typhon is no exception. You can pick up a copy at Amazon or Createspace. If you use Createspace, be sure to enter coupon code CFAK5JBZ for 15% off. 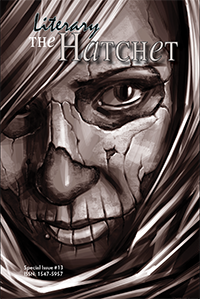 My short story “Assholes with Guns” is out in The Literary Hatchet #13. It’s a story about dangerous men, both young and old. I wrote it in a Noir class taught by Benjamin Whitmer (Cry, Father) that was hosted by LitReactor.com.